But that is not all. The lure of getting someone else’s money is strong. Many, including the bureaucrats administering the programs, will try to get it for themselves rather than have it go to someone else. The temptation to engage in corruption, to cheat, is strong and will not always be resisted or frustrated. People who resist the temptation to cheat will use legitimate means to direct the money to themselves. They will lobby for legislation favorable to themselves, for rules from which they can benefit. The bureaucrats administering the programs will press for better pay and perquisites for themselves — an outcome that larger programs will facilitate. 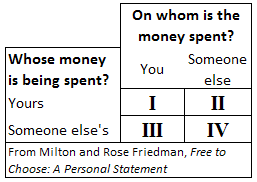 The attempt by people to divert government expenditures to themselves has two consequences that may not be obvious. First, it explains why so many programs tend to benefit middle- and upper-income groups rather than the poor for whom they are supposedly intended. The poor tend to lack not only the skills valued in the market, but also the skills required to be successful in the political scramble for funds. Indeed, their disadvantage in the political market is likely to be greater than in the economic. Once well-meaning reformers who may have helped to get a welfare measure enacted have gone on to their next reform, the poor are left to fend for themselves and they will almost always he overpowered by the groups that have already demonstrated a greater capacity to take advantage of available opportunities. The second consequence is that the net gain to the recipients of the transfer will be less than the total amount transferred. If $100 of somebody else’s money is up for grabs, it pays to spend up to $100 of your own money to get it. The costs incurred to lobby legislators and regulatory authorities, for contributions to political campaigns, and for myriad other items are a pure waste — harming the taxpayer who pays and benefiting no one. They must be subtracted from the gross transfer to get the net gain — and may, of course, at times exceed the gross transfer, leaving a net loss, not gain. These consequences of subsidy seeking also help to explain the pressure for more and more spending, more and more programs. The initial measures fail to achieve the objectives of the well-meaning reformers who sponsored them. They conclude that not enough has been done and seek additional programs. They gain as allies both people who envision careers as bureaucrats administering the programs and people who believe that they can tap the money to be spent. Category IV spending tends also to corrupt the people involved. All such programs put some people in a position to decide what is good for other people. The effect is to instill in the one group a feeling of almost God-like power; in the other, a feeling of childlike dependence. The capacity of the beneficiaries for independence, for making their own decisions, atrophies through disuse. In addition to the waste of money, in addition to the failure to achieve the intended objectives, the end result is to rot the moral fabric that holds a decent society together. Another by-product of Category III or IV spending has the same effect. Voluntary gifts aside, you can spend someone else’s money only by taking it away as government does. The use of force is therefore at the very heart of the welfare state — a bad means that tends to corrupt the good ends. That is also the reason why the welfare state threatens our freedom so seriously.